Own Peppa Pig - A Christmas Compilation DVD from Deff, DVD, Blu-Ray & 4K Video Specialists - Free UK Delivery..
Own Peppa Pig - Around The World DVD from Deff, DVD, Blu-Ray & 4K Video Specialists - Free UK Delivery..
Hello, my name is Peppa Pig. I have selected six of my favourite DVDs for this special box set. It includes: Muddy puddles, Bubbles, My birthday party, Stars, The balloon ride, The fire engine. Please join me and my little brother George on our adventures! We just love jumping in muddy puddles!.. Peppa is a loveable, cheeky little piggy who lives with her younger brother George, Mummy Pig and Daddy Pig. Peppa loves playing games, dressing up, visiting exciting places and making new friends, but her absolute favourite thing is jumping up and down in muddy puddles! 1. Bubbles, 2. Teddy's Day Out, 3. Emily Elephant, 4. Polly's Holiday, 5. George's Friend, 6. Mysteries, 7. Rock Pools, 8. Windy Autumn Day, 9. The Time Capsule, 10. Mr..
Peppa is a loveable, cheeky little piggy who lives with her younger brother George, Mummy Pig and Daddy Pig. Peppa loves playing games, dressing up, visiting exciting places and making new friends, but her absolutely favourite thing is jumping up and down in muddy puddles! 10 brand new piggy tales: 1. Champion Daddy Pig, 2. Secret Club, 3. The New House, 4. Basketball, 5. Horsey Twinkle Toes, 6. Naughty Tortoise, 7. Shadows, 8. Mr Fox'..
Peppa is a lovable, cheeky little piggy who lives with her younger brother George, Mummy Pig and Daddy Pig. Peppa loves playing games, dressing up, visiting exciting places and making new friends, but her absolutely favourite thing is jumping up and down in muddy puddles! 10 brand new piggy tales: 1. Mr Potato's Christmas Show, 2. The Rainy Day Game, 3. Pedro The Cowboy, 4. The Flying Vet, 5. Kylie Kangaroo, 6. Grampy Rabbit's Dinosaur ..
Peppa is a loveable, cheeky little piggy who lives with her younger brother George, Mummy Pig and Daddy Pig. Peppa loves playing games, dressing up, visiting exciting places and making new friends, but her absolutely favourite thing is jumping up and down in muddy puddles! Episodes: 1. Cold WInter Day, 2. Tiny Creatures, 3. Daddy Pig's Office, 4. Sports Day, 5. The Eye Test, 6. Grandad Dog's Garage, 7. Foggy Day, 8. Jumble Sale, 9. Swim..
Peppa is a loveable, cheeky little piggy who lives with her younger brother George, Mummy Pig and Daddy Pig. Peppa loves playing games, dressing up, visiting exciting places and making new friends, but her absolutely favourite thing is jumping up and down in muddy puddles! 1. Flying A Kite, 2. My Cousin Chloe, 3. Daddy Loses His Glasses, 4. Hiccups, 5. Picnic, 6. Mummy Pig's Birthday, 7. Dressing Up, 8. The School Fete, 9. Musical Instr..
Own Peppa Pig - Gift Box DVD from Deff, DVD, Blu-Ray & 4K Video Specialists - Free UK Delivery..
Peppa is a loveable, cheeky little piggy who lives with her younger brother George, Mummy Pig and Daddy Pig. Peppa loves playing games, dressing up, visiting exciting places and making new friends, but her absolutely favourite thing is jumping up and down in muddy puddles! 11 Brand new piggy tales: 1. International Day, 2. Grampy Rabbit's Boatyard, 3. Shake, Rattle And Bang, 4. Pottery, 5. Mr Fox's Van, 6. The Biggest Puddle In The Wor..
Peppa is a loveable, cheeky little piggy who lives with her younger brother George, Mummy Pig and Daddy Pig. Peppa loves playing games, dressing up, visiting exciting places and making new friends, but her absolutely favourite thing is jumping up and down in muddy puddles!.. Own Peppa Pig - Muddy Puddles Doormat from Deff, DVD, Blu-Ray & 4K Video Specialists - Free UK Delivery..
Peppa is a loveable, cheeky little piggy who lives with her younger brother George, Mummy Pig and Daddy Pig. Peppa loves playing games, dressing up, visiting exciting places and making new friends, but her absolutely favourite thing is jumping up and down in muddy puddles! 1. Peppa's Christmas - Peppa and George have fun at Christmas time, playing in the snow, decorating their tree and meeting Father Christmas! Plus! 2. Pirate Island, 3..
Peppa and her friends stage a circus in Grandpa Pig’s tent. Grandpa Pig, Grandad Dog, and Grampy Rabbit are stranded on a desert island. Peppa and George stay up late to help hunt for night animals. And lots more puddles of fun with Peppa, her little brother George, Mummy Pig, Daddy Pig and all their friends! 10 Piggy Tales 1. Peppa's Circus 2. Desert Island 3. Perfume 4. The Aquarium 5. George's Racing Car 6. The Little Boat 7. Grampy ..
Peppa is a loveable, cheeky little piggy who lives with her younger brother George, Mummy Pig and Daddy Pig. Peppa loves playing games, dressing up, visiting exciting places and making new friends, but her absolutely favourite thing is jumping up and down in muddy puddles! 1. Piggy In The Middle, 2. Fancy Dress Party, 3. Very Hot Day, 4. Mister Skinny Legs, 5. Lunch, 6. Sleepy Princess, 7. The Tree House, 8. Daddy Gets Fit, 9. Shopping,..
Daddy Pig is throwing a special party. Everyone is invited, and they are all coming dressed in scary costumes. Peppa is a witch, George is a dinosaur, Rebecca Rabbit is a carrot...gone bad! Plus lots more puddles of fun with Peppa, her little brother George, Mummy Pig, Daddy Pig and all their friends! Piggy Tales 1. Pumpkin Party 2. The Fish Pond 3. Pirate Treasue 4. The Sandpit 5. The Olden Days 6. Fruit 7. Mr Bull in a China Shop 8. G..
Peppa is a loveable, cheeky little piggy who lives with her younger brother George, Mummy Pig and Daddy Pig. peppa loves playing games, dressing up, visiting exciting places and making new friends, but her absolutely favourite thing is jumping up and down in muddy puddles! Episodes: 1. Santa's Grotto 2. Santa's Visit 3. Mr Potato Comes to Town 4. Granny Pig's Chickens 5. Talent Day 6. Goldie the Fish 7. Funfair 8. Digging Up The Road..
Own Peppa Pig - Selection Box DVD from Deff, DVD, Blu-Ray & 4K Video Specialists - Free UK Delivery..
Peppa's Christmas: Join Peppa and her family in a special 10 minute episode as they try to get everything ready for Christmas. There's just so much to do! Cold Winter Day: It is a very cold winter day and all the puddles in the park have magically frozen over! Peppa and George have to use all their imagination to find new fun games to play. Santa's Grotto: Peppa and George are off to see Father Christmas! Peppa's so excited, but what wi..
Own Peppa Pig - The Christmas Collection DVD from Deff, DVD, Blu-Ray & 4K Video Specialists - Free UK Delivery..
Own Peppa Pig The Easter Bunny DVD from Deff, DVD, Blu-Ray & 4K Video Specialists - Free UK Delivery..
Peppa is a loveable, cheeky little piggy who lives with her younger brother George, Mummy Pig and Daddy Pig. Peppa loves playing games, dressing up, visiting exciting places and making new friends, but her absolute favourite thing is jumping up and down in muddy puddles! 10 Brand new piggy tales: 1. Washing, 2. Polly's Boat Trip, 3. Delphine Donkey, 4. Fire Engine, 5. Numbers, 6. Grandpa At The Playground, 7. Danny's Pirate Party, 8. Th.. In her first ever 15 minute special, Peppa has a brand new pair of golden boots for the big Puddle Jump contest, but they've gone missing! Will she ever get them back in time? Daddy pig's found an old box of garden games but it's hard to play all together as George finds them too difficult! George has a new huge dinosaur balloon, but it's so big how will he stop it flying away?! Uh oh, the school roof is leaking again so Peppa and all h..
Peppa is a lovable, cheeky little piggy who lives with her younger brother George, Mummy Pig and Daddy Pig. Peppa loves playing games, dressing up, visiting exciting places and making new friends, but her absolutely favourite thing is jumping up and down in muddy puddles! 11 Brand new piggy tales: 1. Flying On Holiday, 2. The Holiday House, 3. Holiday In The Sun, 4. The End Of The Holiday, 5. George's New Dinosaur, 6. Grandpa Pig's Trai..
Hello, my name is Peppa Pig. In honour of the Queen's Jubilee, I have selected nine of my very favourite celebratory episodes to feature on this compilation DVD. Also included is a brand new, never-before-seen episode, The Queen to commemorate this very special royal occasion. Join me and my little brother George as we relive some of our extra special moments with you. Special Features Plus! 2 Bonus Episodes From Ben & Holly's Little K..
Own Peppa Pig - Gerald Giraffe DVD from Deff, DVD, Blu-Ray & 4K Video Specialists - Free UK Delivery..
Peppa is a loveable, cheeky little piggy who lives with her younger brother George, Mummy Pig and Daddy Pig. Peppa loves playing games, dressing up, visiting exciting places and making new friends, but her absolutely favourite thing is jumping up and down in muddy puddles! 1. Muddy Puddles, 2. Mr. Dinosaur Is Lost, 3. Polly Parrot, 4. Best Friend, 5. Hide And Seek, 6. The Playgroup, 7. Mummy Pig At Work, 8. Camping, 9. Gardening, 10. Bi..
Peppa is a loveable, cheeky little piggy who lives with her younger brother George, Mummy Pig and Daddy Pig. Peppa loves playing games, dressing up, visiting exciting places and making new friends, but her absolutely favourite thing is jumping up and down in muddy puddles! 1. My Birthday Party, 2. The Playground, 3. Tidying Up, 4. Frogs And Worms And Butterflies, 5. Daddy Puts Up A Picture, 6. At The Beach, 7. Cleaning The Car, 8. Grand..
Own Peppa Pig - My First Cinema Experience DVD from Deff, DVD, Blu-Ray & 4K Video Specialists - Free UK Delivery..
Peppa is a loveable, cheeky little piggy who lives with her younger brother George, Mummy Pig and Daddy Pig. Peppa loves playing games, dressing up, visiting exciting places and making new friends, but her absolutely favourite thing is jumping up and down in muddy puddles! 1. New Shoes, 2. Ballet Lesson, 3. The Tooth Fairy, 4. Treasure Hunt, 5. Not Very Well, 6. Windy Castle, 7. Pancakes, 8. The Museum, 9. Secrets, 10. Thunderstorm Spe..
Peppa is a loveable, cheeky little piggy who lives with her younger brother George, Mummy Pig and Daddy Pig. Peppa loves playing games, dressing up, visiting exciting places and making new friends, but her absolutely favourite thing is jumping up and down in muddy puddles! 10 brand new piggy tales: 1. Potato City, 2. Whistling, 3. Dr Hamster's Tortoise, 4. Grandpa Pig's Computer, 5. Hospital, 6. Spring, 7. Miss Rabbit's Helicopter, 8. 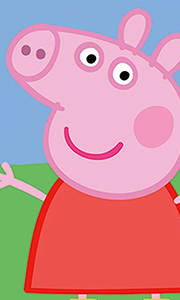 B..
Peppa is a loveable, cheeky little piggy who lives with her younger brother George, Mummy Pig and Daddy Pig. Peppa loves playing games, dressing up, visiting exciting places and making new friends, but her absolutely favourite thing is jumping up and down in muddy puddles! 10 brand new Piggy tales: 1. Princess Peppa, 2. Work And Play, 3. The Rainbow, 4. Pedro's Cough, 5. The Library, 6. The Camper Van, 7. The Camping Holiday, 8. Compost..
Peppa is a loveable, cheeky little piggy who lives with her younger brother George, Mummy Pig and Daddy Pig. Peppa loves playing games, dressing up, visiting exciting places and making new friends, but her absolutely favourite thing is jumping up and down in muddy puddles! 1. The Balloon Ride, 2. George Catches A Cold, 3. Rebecca Rabbit, 4. Grandpa's Little Train, 5. Painting, 6. Ice Skating, 7. Dens, 8. The Baby Piggy, 9. The Cycle Rid..
Own Peppa Pig - The Muddy Puddles Collection DVD from Deff, DVD, Blu-Ray & 4K Video Specialists - Free UK Delivery..
Own Peppa Pig - When I Grow Up DVD from Deff, DVD, Blu-Ray & 4K Video Specialists - Free UK Delivery.. Enjoy 10 years of Muddy Puddles, as voted for by you! From the very first episode Muddy Puddles, Peppa and George's favourite game has become an icon of the hit television series. Have fun celebrating with these 'muddy puddle' classics including. The Queen, Champion Daddy Pig, Baby Alexander, The Biggest Muddy Puddle In The World and more! 10 Muddy Puddles Tales: 1. Muddy Puddles, 2. The Queen, 3. Baby Alexander, 4. The Biggest Muddy Pu..